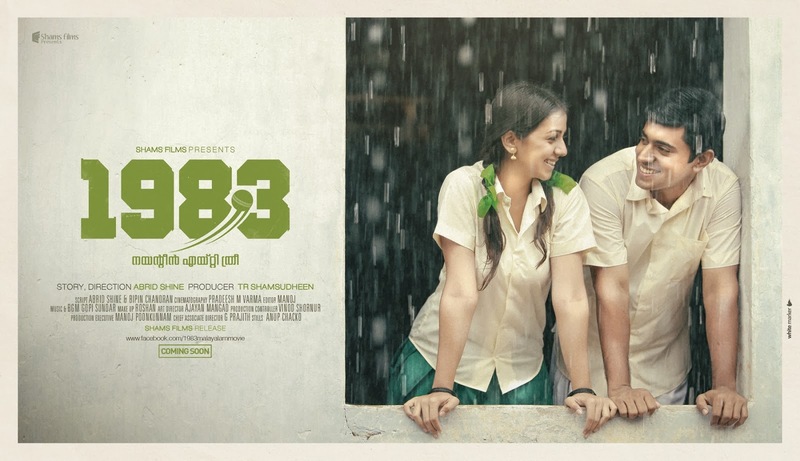 Abrid Shine's directorial venture 1983, with Nivin Pauly in the lead, is the first movie in Malayalam to talk about cricket, a passion for Indians more than just being a game. The movie too talks the passion for cricket among some people in a remote village in Kerala, starting from the year 1983, where India won their first World Cup, till the present. Story The movie is set against the backdrop of a visually appealing village, Brahmamangalam. The story unfolds from the year of 1983, where some children of the village along with others, rejoice the world cup victory of India. Rameshan (Nivin Pauly) , the star batsman of them, Pappan (Saiju Kurup), Babukuttan (Sanju), Saji (Dinesh), Prahladan (Neeraj Madhav), Mantle Johny (Kalabhavan Prajod), Varkey, Chandru, Basheer, forming the rest of the gang. The movie is set against the backdrop of a visually appealing village, Brahmamangalam. They grow up holding cricket to their hearts. Gopi Aashaan (Joy Mathew), Rameshan's father, running a mechanic shop, is all against his son's love for cricket, which had spoiled his ambitions of Rameshan becoming a mechanical engineer. At school, Rameshan has his love Manjula (Nikki Galrani), who after their studies eagerly hopes for Rameshan to find a good job and to marry her. Rameshan on the contrary, can't leave his passion for cricket as he attends almost all village cricket matches even after growing up and looking after his father's workshop. Manjula gets married to another guy, and leaves abroad and Rameshan, being compelled by his parents and friends, marries Susheela (Srindaa Ashab), whom he finds to be the only person in India, who doesn't know about Sachin Tendulkar. Their happy life becomes more fruitful with the birth of Kannan, and after a few years, Rameshan gets to know his son has got his same passion for cricket. Rameshan gets his son to Vijay Menon (Anoop Menon), a cricket coach, who helps Kannan to become an efficient player, which forms the rest of the movie. Everyone have done full justice to their roles. Nivin Pauly, the central character of the movie is all controlled and composed portraying the character of Rameshan in his school life and later. Nikki Galrani as Manjula too scores well with her looks, but the dubbing portions seems a bit awkward. Srindaa Ashab as Susheela gives out a wonderful performance with her innocent expressions and dialect. Another notable performance is from Jacob Gregory as Sachin, who turns few sequences featuring him to a laughter riot. Anoop Menon as Vijay Menon is yet another notable performance in the movie. Other actors including Joy Mathew, Dinesh, Saiju Kurup, Neeraj Madhav, Kalabhavan Prachod, Sanju, Joju, Seema G Nair, everyone have portrayed their characters well. The child artists also need a special mention for the wonderful performances. Music by Gopi Sunder is a treat to the ears. Especially the song 'Olanjaali kuruvi...' sung by Vani Jayaram and Jayachandran, is sure to capture anyone's mind. Other songs too suits the movie theme. BGM of the movie is pleasing and high on energy. Cinematography by Pradeesh M Varma is near flawless. He has done exceptionally well to capture the splendid visuals of the village. Cricket matches too are taken with sheer brilliance. The story of the movie by the director himself, is near perfect. Dialogues of the movie, written by the director and Bibin Chandran, is capable of creating laughter all over. On the whole, putting aside some lags, 1983 is a thoroughly enjoyable entertainer which pleases your heart throughout. For almost all generations, it's a nostalgic revisit to those childhood memories, where you had played cricket with your friends, a tennis ball, wickets of stick, and a bat carved from leaf stalk. If you have that passion for cricket or is in need of setting aside your stress, Abrid Shine is here with his debut movie 1983 which promises to relax your mind.